A total solar eclipse is a rare event, something to appreciate, Jesuit Brother Guy Consolmagno, director of the Vatican Observatory has told Catholic News Service. So as the first eclipse crossed the United States from coast to coast in 99 years yesterday, Br Consolmagno wasn't going to do anything but take it in and think about the beauty and mystery of God's creation. The astronomer urged an audience in a packed Sts. Peter and Paul Church during a pre-eclipse program in Hopkinsville, a southwestern Kentucky town near the point of maximum eclipse, to take the time to reflect on what the two minutes and 40 seconds of totality means to them. "Pray for good weather," he said to laughs. "But also pray for what God wants you to learn from the experience." Tens of thousands of people had descended on Hopkinsville, a city of 33,000, and thousands more arrived on the morning of the eclipse. 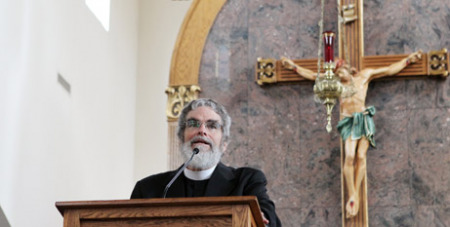 Br Consolmagno said he was as excited as anyone to view the blackening of the sun. "Being a scientist can be a way of worshipping God," he said. "We're here not just to remind my fellow scientists who are used to me by now, but also to show religious people how important is it to be able to praise the Creator by studying creation, studying it honestly, finding out how God really created this place. There's never going to be a shortage of marvels for us to discover or surprises for us to experience," he said. "We can come to know the Creator by seeing the things of his creation."